The CIGS startup stayed mum about its technology and production development for more than a year before it announced commercial shipment. MiaSolé, a company without a sign on its front door to minimize industrial espionage, has cleared the big hump for CIGS manufacturers: shipping solar panels to customers. The Santa Clara, Calif.-based company – which has maintained a low profile in the market for the last year and a half – started to send its solar panels to customers for them to check out the products' performance in June this year. In October, the company began commercial shipment and started recording revenues, said Joseph Laia, CEO of MiaSolé. "We've focused on getting our process and uniformity work. Then we work on reliability, the cost and yield," said Laia. "It involves the best people I've worked with in the past 20 years. We've worked irrationally hard." The company now has a factory with an annual production capacity of 60 megawatts, and is in the process of expanding that to 140 megawatts, Laia said. The shipment milestone is no small feat for a company whose survival seemed questionable a few years ago. The fact that there isn't a MiaSolé sign in front of the company's building is still interpreted by some people as a sign of the startup's impending demise. Laia said he actually took down the sign around two years ago to keep a low profile and prevent competitors or other curious folks from going through the company's trash to find out what the company was doing. Laia joined MiaSolé in 2007 to replace the founder David Pearce, whose departure took place around the time when the company laid off dozens of people (see MiaSolé: Layoffs Raise Questions about Technology). Laia was the group vice president of metrology for KLA-Tencor, maker of semiconductor factory equipment in Milpitas, Calif., before joining the solar startup. MiaSolé has raised at least $300 million in venture capital since its inception in 2001, according to Eric Wesoff, an analyst with GTM Research. The company belongs to a group of high-profile startup companies aiming to popularize solar panels made with copper, indium, gallium and selenium (CIGS). Most of the solar panels today contain solar cells with crystalline silicon. But crystalline silicon isn't cheap, inspiring a large crop of companies to develop competing technologies that rely on alternative materials at much smaller quantities. Some startups are using a cadmium-telluride compound while others are employing amorphous-silicon instead (see Amorphous Silicon: Staking a Claim in Solar Market). The CIGS technology seems promising because researchers have been able to produce cells in their labs that could reach an efficiency of about 20 percent. That efficiency is higher than the best lab cells using amorphous silicon or cadmium telluride. Investors have poured billions of dollars into five CIGS companies alone. But no one has yet to become a manufacturing powerhouse. One of them, Fremont, Calif.-based Solyndra, is building a second factory complex with a federal loan of $535 million, and the factory is set to be big enough to accommodate 500 megawatts of annual production capacity eventually. Nanosolar, in San Jose, Calif., began mass production over the past year. "In the last four to five years there has been a lot of chatters in the press and blog sphere among many startup guys about how smart they were and how special their technologies were," Laia said. "People believed it and none came to pass. It tainted the whole CIGS thing, and people at this point don't think it can be done." MiaSolé, too, thought it would start making money a lot sooner. The company had promised to start commercial shipment in 2007, before Laia joined the company. At that time, MiaSolé was making solar cells that could only convert 5 percent of the sunlight that falls on them into electricity (see MiaSolé Clears the Air). Competitors were mass-producing cells with twice or three times the efficiencies. Within a year, MiaSolé was able to produce cells with efficiencies in the low teens. It was a dramatic improvement owing to how the company found a way to make the sputtering technique work in depositing CIGS onto flexible roll of steel a meter wide. Exactly how MiaSolé was able to improve the numbers so quickly is not something Laia is willing to divulge. The company also backed out of two government-funded projects in order to focus on improving the solar cell efficiency and the manufacturing process. The projects would've required MiaSolé to figure out ways to embed solar cells into building materials. Laia said taking on those projects didn't make sense because the market didn't have any low-cost, waterproof materials that could protect solar cells from moisture for two decades or more. Back in mid-2008, Laia thought the company could start commercial shipment by the end of 2008. The company didn't meet that goal and remained mum for nearly a year, issuing no press releases. That is, until last month, when it announced a new hire and product shipment. 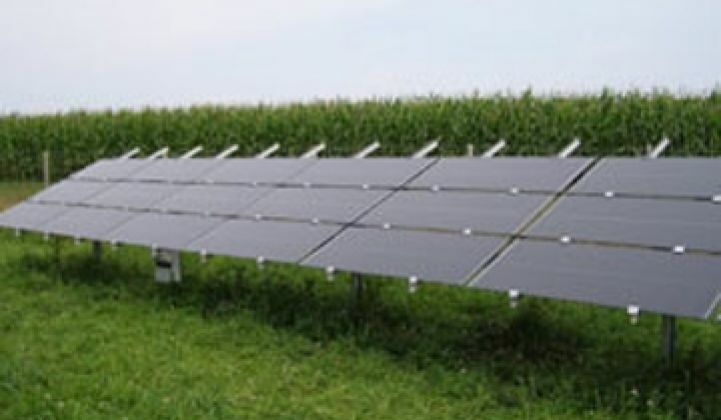 Its solar panels also had gotten safety and performance certifications from Underwriters Laboratories. MiaSolé has shipped to "30 customer sites" in Europe and the United States, but Laia declined to provide more details about the customers or how many have been installed. He said one of its customers does plan to announce the project, located in California, next month. The company now produces solar panels with average efficiencies of 10.2 percent to 10.5 percent, Laia said. MiaSolé is finally taking off, but at a time when competition has become especially intense, thanks mainly to the recession. Crystalline silicon solar panel prices have fallen by 30 percent to 50 percent over the past year as demand dived during the first half of 2009. Sales have since picked up, but manufacturers don't expect the pricing to return to the 2008 levels. That market dynamics is particularly tough on startup companies, which must compete with those with much larger factories of hundreds of megawatts each and an established set of customers and sales channels. MiaSolé isn't immune to the challenges, and its longevity isn't secured. Laia said there is no mystery to how startup companies could compete effectively: They have to show they can deliver the efficiencies and prices as promised, and those numbers must be comparable to going rates in the market. "If you are a customer, you ask yourself if these guys can scale and grow and meet my demand with quality and costs," Laia said. "It's a commodity play, and we are just selling electrons." He declined to disclose the company's manufacturing costs. The pricing declines for solar panels will help boost installations in the U.S., which is more price-sensitive because it lacks the kind of incentives many European countries provide to encourage renewable energy generation, he said. MiaSolé is making solar panels with cells encased in glass. But the company isn't shying away from pursuing opportunities to embed its thin films into building materials. Some of its CIGS competitors are going after that same, so-called building integrated market. (See Global Solar: BIPV Market Or Bust).